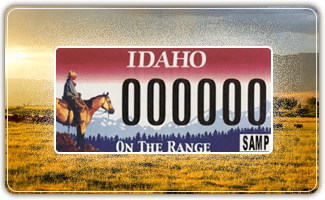 Show your western spirit and support rangeland education with the new Idaho “On the Range” specialty license plate. The 2008 Idaho Legislature enacted a new special interest license plate program to help promote Idaho’s vast rangelands. This new plate became available on January 2, 2009, at your local county auto-licensing office. Visit ITD’s website at to order your personalized Range plate today. An initial program fee of $35 will be charged when the plate is first purchased with each subsequent renewal costing $25. These program fees are in addition to all other applicable annual registration fees, county administrative fees, and plate fees. All but $10.00 of the special program fees go to the Idaho Rangeland Resource Commission. This new license plate may only be displayed on passenger vehicles, light trucks with a gross vehicle weight of up to 26,000 pounds, motorhomes, and camper trailers – (excluding horse, car, and cargo trailers with living facilities). These special plates can also be personalized with up to five letters and/ or numbers. The cost to personalize these plates is $25 in addition to both the special program fees and all other required annual registration and plate fees. The renewal fee for a personalized plate is an additional $15 per year. Individuals can also purchase sample versions of the Idaho Rangeland license plates from the transportation department for $30. Twenty dollars of each sample plate sale goes to the plate’s special interest fund. Sample plates can be personalized at no additional cost; these plates cannot be displayed on motor vehicles, but they do make unique gifts for friends and family. Standard issue sequentially numbered license Idaho Rangeland license plates are only available at your local county assessor’s office after they are released for sale. The personalized and sample versions of these plates are only available by mail or by fax through the Idaho Transportation Department or they can be ordered online through the department’s web site – https://www.accessidaho.org/secure/itd/personalized/plates.html. All future renewals for these new plates will be processed at your local county auto-licensing offices.